U.S. Marine Gen. James Mattis and Kandahar Provincial Governor Gul Agha Shirzai attend a flag raising ceremony in which the American and Afghan flags were raised at Kandahar International Airport, January 1, 2002. 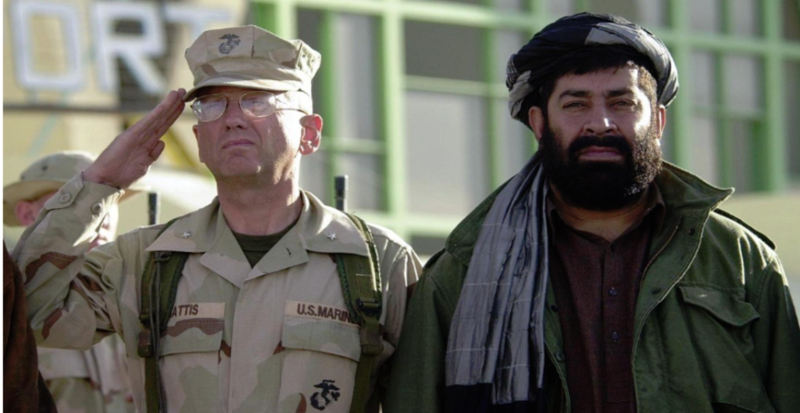 At PJ Media, I explain how General, and now Secretary of Defense James Mattis’ “Counterinsurgency” [COIN] doctrine—a toxic brew of Islamic bowdlerization, and willful, morally depraved disregard for the safety of American troops—are responsible for the ongoing murder of U.S. military personnel by our ostensible “Afghan allies,” during so-called “green on blue,” or “insider” attacks. Please read it all, here.